LA Bike Plan - Incredible support from mountain bikers! 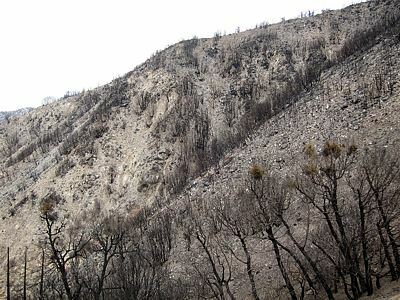 Area next to the Sam Merrill Trail that was burned by the Station Fire. 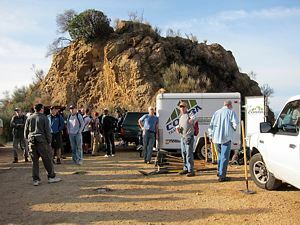 Of the 70 volunteers who helped rebuild the trail on January 9, about 50 were mountain bikers and CORBA volunteers. See story. Recently the Board of Directors held it’s annual election of officers. I am honored to have been chosen to represent CORBA’s Board of Directors as President. First I must congratulate outgoing President Jeff Klinger for an outstanding tenure of more than six years. His tireless work on behalf of mountain bikers and open space enthusiasts has resulted in many positive gains for the outdoors community. Jeff also served as Treasurer, and I would like to congratulate Danusia Bennett-Taber for being elected to the position. 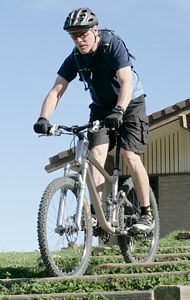 Jeff continues to serve on the board and is dedicated to CORBA and mountain biking recreation. I would also like to welcome our newest board member, Steve Messer. While he is new to the board, Steve is no stranger to the mountain biking community. He has worked for years with CORBA’s trail work crew, and he recently headed up the letter writing campaign that generated more than 900 letters in support of including mountain biking in the Los Angeles Bicycle Master Plan. As the new decade dawns, CORBA is needed more than ever. There are still people and organizations that want to ban mountain bikes from the trails. This position is short-sighted and selfish, as it is widely known that the more people who are allowed access to open space, the more likely that open space will remain open to the public. We must always be vigilant to make sure those who would ban bikes do not unfairly and inaccurately depict mountain biking to elected officials and land managers. CORBA recognizes that there is an increasing demand by mountain bikers for technical terrain, including human made features, where they can challenge their riding ability. CORBA has been working with local land managers to identify areas where these kinds of trails can exist, as well as working with several agencies to implement bike parks with skills features and pump tracks. We are very excited about these projects and hope to announce more within the coming year. Many people ask, “what is CORBA?” CORBA is made up of mountain bikers and outdoor enthusiasts who want to enjoy our pubic open space in a safe and responsible manner. In the coming months we will be soliciting your participation in several new committees we have created to better serve the mountain bike and outdoor community in Los Angeles and surrounding areas. I am very excited about CORBA as we move forward. I hope you will join me in helping to preserve, maintain, and gain access to our cherished open space trails. Repaired 48 miles of local trails with over 2,200 hours of volunteer labor. Represented SoCal Interscholastic Cycling League at IMBA Advocacy Summitt, Interbike IMBA breakfast meeting, Santa Monica Mountains National Recreation Area, City of Glendale Trails Planning meetings (including assisting them with implementation of their trails master plan), City of Burbank Trails Committee Meetings, San Gabriel Watershed and Mountains Special Resource Study public hearings, City of Los Angeles Master Bike Plan public hearings. 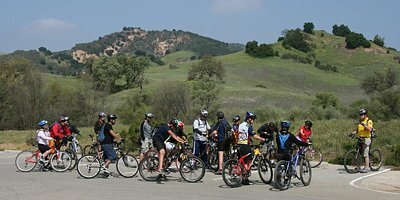 Confronted and challenged anti-bike groups wanting to exclude mountain bike use in Los Angeles City Bicycle Master Plan and Palos Verdes Peninsula; worked with Los Angeles Bicycle Advisory Council and Los Angeles County Bicycle Coalition to keep mountain biking language in Bicycle Master Plan. Led a campaign for getting mountain bikers' voices heard regarding the Bicycle Master Plan, generating more than 900 letters to the City of Los Angeles. Reached out to represent mountain bikers through the media: Interviews on Bike Talk Radio with Steve Messer, Jeff Klinger, and Jim Hasenauer. Jim Hasenauer also was interviewed on KABC-7 TV regarding the Bike Master Plan; coverage in Mountain Bike Action on-line (LA City Bicycle Plan, Fat Tire Fest) and LA Times (Fat Tire Fest). Met with local land managers to improve the image of, and trail access for, mountain bikers. Met with California Department of Parks and Recreation to determine status of Sin Nombre and Two Foxes trails, because they told us they were closed. They were (and continue to be) open to shared use, thanks to CORBA. Put kids on bikes: Take a Kid MTB Day with 25 kids participating; Youth Adventures at-risk and inner city youth rides: 14 rides, 220 kids; dozens of kids riding bikes at Fat Tire Fest's Kid Zone and Fun Rides. Raised more than $14,000 for mountain bike advocacy: CORBA's Fat Tire Fest raised funds and awareness for continuing its advocacy efforts and programs. More than 500 people attended the event. Held 14 free mountain bike skills clinics (including two special clinics for the Mountain Bike Unit) with a total of 247 participants. Donated funds to support congruent mountain biking organizations: Mountain Bike Unit, SoCal Interscholastic Cycling League. Donated funds to the Santa Monica Mountains Trails Council to help support State Trails Day at Pt. Mugu State Park. Funded invasive plant control on the New Millennium Trail in Calabasas. Published the quarterly Terra Times Newsletter to keep members informed. Went to monthly digital-only format in November 2009 to help reduce paper consumption, and increase information to our membership and local organizations and agencies. Internally, began the process of improving and streamlining communications between CORBA's volunteers and the public. Expect more from us in the coming year. Revenue: Almost two thirds of our revenue comes from fundraising at the Fat Tire Fest. Next, generating almost a third of our income is charitable contributions and dues from our individual members - we thank you for your ongoing support! Advocacy: Our most significant expenditure in this category was donations to organizations that support mountain biking and trails. We are passionate about mountain biking and open space and we support other organizations that share our passion. Trail Crew: Our largest expense is insurance and renting storage space for the equipment. Other costs include purchases of the tools and equipment maintenance. We also reward our Trail Crew volunteers by providing them with food and CORBA shirts. Check our calendar and join the crew! Skills Clinic: The main expense is insurance and occasional cost of running promo ads. Youth Adventures: This year we had a one-time expense of repairing the trailer we use to store and transport the kids' bikes and other equipment. Our largest expense is bike purchases and insurance. Other expenses include snacks and water for the kids, purchase of bike parts necessary to fix our bike fleet, maintenance for the bike repair shed plus new helmets. Several bike shops and bike companies support our program by donating bike parts, gloves, tires, patch kits and other small items. Events: By far the largest expense is related to organizing CORBA's Fat Tire Fest. This expense is offset by revenue from this event. As a matter of fact, 2/3 of our annual revenue comes from fundraising at the Fat Tire Fest. Save the Date! CORBA’s 2010 Fat Tire Fest Sunday, October 17, 2010 at Castaic Lake State Recreation Area. Administration and Operations: These expenses are for things like storage space rental, printing, postage, insurance, web hosting, telecommunications, meeting expenses and general office supplies. This is a weekend event with CORBA, SMMTC and other trail user groups with camping at Danielson Ranch in Point Mugu State Park. You can come in Friday night and stay until Sunday or leave Saturday after trail maintenance. Some people just come in for Saturday. There will be a barbecue and raffle on Saturday evening. Informational flyer and registration form coming soon. Details. CORBA's intrepid trail crew took part in a joint trail maintenance day on one of the most beloved trails in the Angeles front country. Seventy people came out to give back to the trails, a measure of just how popular this trail is. The Sam Merrill Trail from Inspiration Point to Echo Mountain has been closed since the Station Fire last year. The first half-mile of the trail was the burn area, but the remainder of the trail was in need of water diversion and erosion control work. Even though it was closed, there was a need to ensure that what remains was prepared for the coming rains, with the hope of getting this trail opened again as soon as possible after the rainy season passes. CORBA had approximately 50 mountain bikers come out for the trailwork day, including about 15 student racers from the Interscholastic Mountain Bike League. Hiking groups were there with about 20 people. We were introduced to Andrew Fish who is now managing the trail system for the Angeles National Forest. Since we were working on a closed trail, we had to have NFS Rangers accompany the work crews. Much was accomplished. The mountain biking contingent did brush and tread work all the way up to the burn zone. 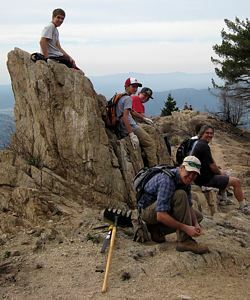 The Bear Canyon Hiking club and others worked in the burn areas up near the top of the trail, recovering as much of the trail as they could. CORBA supplied lunch for all of the volunteers. It was a great day and everyone came away from the work day feeling good about what they'd done to help preserve this trail, even though it is expected to remain closed until at least spring. Would you like to learn more? We invite you to come to King Gillette Ranch Auditorium at 9:00 am on Saturday, February 6, 2010 for an indoor orientation meeting where we will share with you more details about this wonderful program and what patrolling with the MBU is all about. We encourage you to bring your bike and helmet because we plan on going for a bit of a fun ride after the presentation (weather permitting). For more details, visit the MBU training web page. To see the MBU in action, view our gallery of MBU photos. LA Bike Plan Report Update - Support from CORBA Members and Friends Is Incredible! Sadly, several Los Angeles City statutes make it illegal to ride on a trail in any City Park. After more than 18 months of development, Los Angeles' Draft Bicycle Plan did nothing to change that. It took recommendations off the table that had been included in the plan's last revision in 1996. It called for studies to assess our needs for trail access, but provided little in the way of concrete guidance on the issue. The plan has been the subject of intense scrutiny from all facets of cycling, including its off-road components. When the draft document was released in late September, the City held five public workshops, and allowed just six weeks to digest and comment upon this 563 page document. Bowing to pressure from the cycling community at large, the City extended it's comment period until January 8, 2010. CORBA representatives attended all of the public workshops. The extended comment period gave us the opportunity to review the plan in detail, and compile our official response. We then called upon the mountain biking community at large, and you responded. CORBA put together a grass-roots advocacy campaign, with a petition and an email and letter-writing drive. Between December 19, 2009 and January 7, 2010, 929 letters and signatures from mountain bikers were gathered. On January 8 we delivered those letters to the City of L.A. Planning Department. Key City officials, Rec and Parks personnel and Members of L.A. City Council also received copies of all the letters and petitions via email. We got the City's attention. This was the biggest response CORBA has ever received to an advocacy campaign. Mountain bikers stood up for themselves, demanding a change to the decades old ban on bicycles in City Parks. We need more options for outdoor recreation and exercise, especially for kids. Currently, the City is revising the draft plan, taking into consideration all of the comments received. A second draft is expected to be released within the next two months, and will be followed by another comment period before being submitted to the City Council for adoption. We'll keep you informed and updated on the progress. CORBA is looking forward to working with the City to make its parks more inclusive of all user groups, including off-road cyclists. Thank you for standing up for yourselves! A large portion of the Portuguese Bend Reserve remains closed because of last year’s fire. There is still no word on when it will reopen. Rangers continue to patrol the area, issuing tickets or warnings to anyone who enters the closed area or uses any unauthorized trail. Several mountain bikers have been ticketed along with hikers and dog walkers. At this point, enforcement appears to be evenly distributed. Recent rains have not only hampered riding but also damaged numerous trails. Fortunately, we have a trail crew-training program directed by Kurt Loheit with excellent mountain biker representation. Last week’s work included filling in BSRs (bike sucking ruts) and preparing trails for the next series of storms. On the political scene, we’re waiting for the city council, with two new members, to address trail issues. The city recently established a goal of re-examining the trails network plan. Cyclists should get an opportunity to ask for more trail access. However, success will depend to a large degree on good trail behavior. Volunteering for trail work will help as well. Saturday February 6th is the next skills clinic.